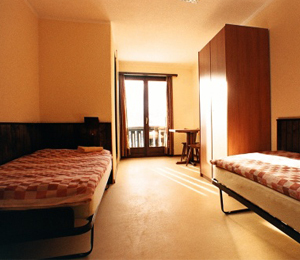 The Hotel has 45 double rooms, which are simple and functional. Every 2 Bedrooms share a common front room with 2 sinks, one shower-room and one WC.Every morning we spoil you with a large breakfast buffet. A three course dinner is available as well ( just main season) at an additional cost. After dinner you can relax at our in house bar and enjoy the easygoing atmosphere and recuperate from your long day of sports and activities. Simple room for an affordable price.